So...you are looking to start a poultry farm business in Kerala State, India? This is a step-by-step, how-to, practical manual to getting things right. The format is simple, easy to understand, informative with real life examples. A 1-page all-inclusive poultry farm business plan for all who live in the beautiful South-Western Indian State of Kerala (Malabar Coast)! We hope this helps no matter where you are in planning your local or regional poultry enterprise. Pressed for time and can't read the whole guide right now? Yes, give me my download pdf to take away! 1. "How will this guide help me with poultry farming in Kerala?" If you are living in Kerala and are already involved in poultry farming...this business plan could help you grow or expand. If you are starting up a poultry farm and still need planning assistance - our advice below is a one-stop shop. ...this business plan has go you covered. ...but, we'll leave you to judge that for yourself. 2) Is this poultry farming business plan suitable for 'commercial' or 'backyard' operation? Whilst scale is contextual, the baseline principles of a poultry farm are entirely transferable and translatable to any scenario. This in simplicity is the beauty of adopting chicken farming as your next venture. this plan has simple beginners tips for getting you started. this plan has the metrics, financial gearing and advanced management topics to satisfy your queries. 3) Is this a plan for layer (egg), broiler (meat) or local breed poultry production? Layer, broiler, local breed - complete with distinct pros vs. cons; advantages vs. disadvantages; comparisons and everything you need to confidently choose and verify you plans. this is a very fortunate location to start your poultry farm! 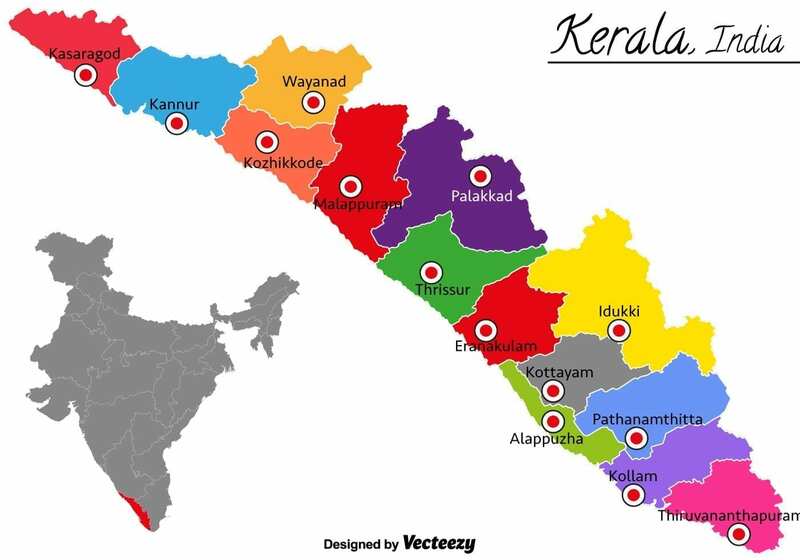 A diverse southwesterly region of India, benefited by the it's favourable coastal geographic situation - Kerala has long been established as an agri-enterprise hub of South India. Famous mostly for it's black pepper (97% of the nation's production originate from the state), cashew farming, cereal (...in particular rice production with over 600 genus varieties) the state is known for hosting a very mixed agricultural economy. The [a] gap between the production and requirement of egg is also increasing at an alarming rate. Concerted [b] efforts of the State to increase the egg production has began to show signs of improvement. Egg production which was 1379 Million .Nos in 2007 increased to 1510 M.Nos in 2008 and to 1633 M.Nos. in 2009; an increase of 8 percent over 2008. Though [c] meat production is increasing over the years, it cannot cater to the demand fully. [a] ...consumer demand for eggs particularly is increasing and the corresponding supply is insufficient. [b] ...the Government of Kerala State look have a record of favouring the offering of financial subsidy to start-up poultry farmers. [c] ...chicken meat production has been on the increase steadily, but there is still plenty room in the market for new entrants as of 2011. Kerala State is awaiting your brave new venture into poultry production - the market needs what you have to offer! As with deriving a liveable income from any agribusiness, poultry farming takes real commitment. Even before launch you'll need to engage in much prerequisite preparation to ensure best efforts for success. "What Does It Take To Run A Successful Poultry Farm In Kerala?" Business start-up has to be one of the most trialling and rigorous endeavours known to modern man. ...the truth of hard graft, labour, frustration and testing at times often is the last thought in our minds. If ill-prepared, there will be failure and loss. Starting up a business from scratch is hard and poultry farming has it's own unique challenges. However, the fruits can be greatly rewarding (!) - and for a long time to come. We don't exclude this from anyone willing to hope and strive for success - faithfully. Know one thing, if you are prepared to give it EVERYTHING you've got - make the sacrifice - you should not be disappointed. "Can I Start A Small Budget Poultry Farm In Kerala & Grow Slowly, But Surely?" Operating within your means is the prudent way to do business. Exceed this to accrue debt, means you run the risk of destabilising your enterprise before you get started. Poultry farming on a budget is certainly feasible within Kerala State. Even despite the downward pressures of price fluctuation and neighbouring state (Tamil Nadu) competition - there is arguably more reason than ever to get involved and make a difference. One of the great things about starting a poultry farm, is scale-ability. This means even at the smallest levels, you can still produce enough to suffice many local families - and get your confidence. Once in full flight with plenty experience under your belt, you can add capacity to your set-up simply by extending the poultry housing & getting more feeder/drinkers. Compounding gains are also another advantage to poultry farming. Even one additional bird, for laying farms or chicken meat farms present addition output and proportionally chips away at your overheads. In short, the consensus advice among professionals is get your feet wet with a small-scale, easily manageable operation. Learn the basics whilst taking on little risk by starting small and therefore, by virtue, lower your risk as you grow your production. "Can A Household or Family Take Up Successful Poultry Farming In Kerala?" Households are the primary source (and obvious choice) of any nation's labour for small-scale poultry farming. The benefits of household labour coming together to serve in micro farming gives great socio-economic growth potential to a region. The future prospects of Kerala would be all the more improved if families, much like yours :), got involved in taking ownership over the productivity. "Where Can I Go To Get Reliable Poultry Farm Training In Kerala?" There are plenty of formal learning courses to attend across Kerala State for poultry farming. Some courses offering officially recognised accreditation upon completion, others giving more grassroots introduction. Either way, see training as an investment. If you are seeking to front a more commercial sized set-up then perhaps some officially recognised qualifications could help. If a small-sized backyard (yet serious) operation is what you have in mind, then a workshop might be a better investment. "Is It A Good Idea To Visit Some Model Examples of Local Poultry Farms First?" A good example goes a long way to helping in the future successes of those who will listen and learn. and get visiting your peers to compare notes? "Which Videos Do You Recommend For A More Visual Approach To Learning?" Here are links we have curated which host a number of useful videos teaching the many factors relating to local poultry farming - all examples of course, based in Kerala! Before starting your poultry business in Kerala, you'll want to be assured of how the poultry market behaves. Factors affecting the 'prevailing economic winds', as it were, are a keen foundation of understanding. Research bears the brunt of the early start-up work load. You'll no doubt spend hours, days and weeks at your desk turning over your ideas, thoughts, concerns and hopes on paper, before eventually taking the plunge. Why Is Poultry Production & Demand So Disparate In Kerala? How Can Local Government Improve Kerala's Poultry Problem? That's the round-up on the facts of the poultry (chicken) trade in Kerala. As seen in our opening introductory chapter, both eggs and chicken meat are in great and growing demand across Kerala State. Both retail/hospitality institutions and households are fast consuming through vast amounts of this high-protein food source. As for layer, broiler or local breed farming...the choice is yours. Each done well, offers their own unique benefits and trading expectations. Broiler vs. Layer poultry production...which should I choose? Ultimately it comes down to suitability and sustainability. In other words, which type will best suit your circumstances, enabling you to keep it going at a profit? Layer hens (female) lay eggs - this is the primary output of a layer farm. The female birds - aka. hens - only (...of course) lay the eggs. Whilst this is not, all you need to know about layer and broiler poultry farming, the aim of the summary above was simply to get you started. ...timings - production intervals are set. You can't get around, nor rush them. This largely dictates your business cash flow expectations. ...target output - reaching target weight or optimum egg laying frequency/quality is what your profit (earnings) expectations are built upon. This output of production is directly correlating with rearing conditions...i.e. feed, water, ventilation etc. - cut corners with input and you short change your output. ...capacity planning - depending on your preferred business model, you might want to set your expectations on a certain multiple of batches reared at a time, leaving convenient intervals for moving flocks between housing. In this way you can calibrate your farm system to bring a certain regularity of product deliveries to market...e.g. weekly meat deliveries rather than every 6-7 weeks. A project report for your poultry farm start-up in Kerala is a critical piece in the preparatory business puzzle. In many ways it is the key to opening up your prospects for finding the right investors, funding or indeed commercial partners, if this is your idea. It's purpose is to focus the eyes of the reader upon the technical and financial gearing of your planned operation. Your project report should tell interested parties clearly, why and how much they ought to invest and what they can expect and when. It's a high-level business sales proposal. Attractiveness is the key here. Knowing what your audience of investors look for in a prospect and showing the benefits of you plan. For a more in-depth understanding of a poultry farm economic analysis, visit this guide. Welcome to Kerala Egg Co.! Hi, my name is Sridhar Gupta - founder and CEO of Kerala Egg Co.
Our management team of experienced poultry professionals and consultants plan to launch a new semi-intensive, integrated layer poultry farming operation. Through this endeavour, we hope to restore a much needed advantage to state based poultry production, which for your years has been under pressure from increasing costs and out of state competition. The resulting economic trend has lead to ever decreasing profits...and a depressed local poultry trade. With the enclosed plan we plan to combat the adverse economic trends with keen business management, deriving excellent product quality and affordability. We hope to generate over 80 jobs for the local Kerala State communities providing much needed gainful labour for households in such challenging financial times. We welcome you to view our project report and consider this an invitation to consider financially assisting the start-up of this much needed layer poultry farm. Mr. Sridhar Gupta and Associates. "...this proposal is for an intensive layer poultry farm in Kerala State, Malappuram district. We hope to acquire an advantageous plot of land to lease & a poultry farm licence in Kerala to host the farm - one which accommodates our planned capacity..."
"...the proposed capacity of this layer farm is 10,000 laying hens...."
"...the model of rearing which we will adopt throughout this plan is 1+1+5 with purchases of 2,000 day old chicks as one batch..."
"...according to the standard FAO rearing guidelines for layer poultry farms in South Asia, our interval of day old chick batch purchase from local Hitch-Hatch Hatcheries in Kerala will be every 12 weeks..."
"...our proposed layer farm overheads are as follows:..."
"...our calculated costs of rearing layer chicks are as follows:..."
"...our one off capital purchases are as follows:..."
"...these figures represent our expected income gained from layer egg sales over the first 6 years of the project, alongside residual income streams from poultry by-products..."
"...this table represents interprets the profit to be made from this layer enterprise as derived from income vs. expenditure..."
"...the benefit cost ratio of this project is 1.13 making it a favourable choice of investment above and beyond alternative opportunities of 15% interest rate..."
This project report example provides an outline - in likeness - to what yours might contain - taking into account scale, scope & systems adopted. We hope this helps you get an idea of how it works. Funding is critical to the success of starting up your poultry farm. Kerala has it's own array of agri-financing options for all types of scale of poultry enterprise. By far, the best option among the lot - if you can afford it! Personally funding your poultry farm allows you to grow organically as it were. ...whatever the means...gather it together and calculate your ability to implement a start-up plan. Without the false influx of borrowed finance, which places you in deficit before you even start. Better than leveraging risk, is to cover the deal entirely yourself. Sure it takes money directly out of your pocket, but better out of yours than someones else's...unless you find yourself being in theirs! This is strictly for the experienced poultry farmer. Contract poultry farming is a commercial scale arrangement between an 'integrator' and farmer. ...extension advisory services (EAS), chicks, feed, medicines and vaccines. They meet in the middle on the basis of performance. The integrator uses commercial leverage to make room for an experienced farm operator with a track record to prosper. The recompense which the farmer receives for their efforts is called the 'rearing charge' - dependent entirely upon delivering the results. The integrator spreads their risk across many farm operations and thus nullifies issues such as overcrowding and disease. It works well for the right parties and offers security going alone simple cannot grant. State governments across India are offering increasing amounts of financial subsidy to support and stimulate the starting up of micro-agricultural business. In Kerala, the Department of Agriculture Development & Farmer's Welfare is the principal steward for..."subsidy disbursal to farmers through various schemes implemented by Department." Getting the support of private investment is another route of acquiring the necessary financial impetus to get started. In Kerala, the key finance partners for agri-businesses of all sizes are typically are Kerala Gramin Bank. Funding a capital project and ownership are inextricably linked. That is to say, those who fund also own. As for the proportion of ownership, that is a matter of negotiation. But it is important to note that the owners of the project, also own the fruits (profit). Again, the proportion is really up for grabs at the negotiation table. The ideal situation for optimal rewards, therefore is to fund the project personally. carefully and prudently weigh-up the gains in feasibility against the losses in sovereignty and control. The business plan or feasibility plan for your poultry farm is a step-by-step outline of action. It adds the meat onto the bone of your project report. According to its name, the plan declares how feasible or rather probable it is that your projections might be achieved. This business plan should comprehensively prove the diligence with which the author has thought through their eventual action. As a document, it is pivotal to giving confidence to assessors of your proposal. ...ensure adherence to the appropriate building regs. ...ensure ample staff coverage, inclusive of time off allocated for annual leave etc. Poultry Waste Incinerator - Aravali Thermal PVT. LTD.
Scheduling inputs properly keeps outputs also consistent. Handling these metrics diligently will ensure you are on track for achieving those results set out in your project report. Successful marketing strategy is your ticket for converting hard agricultural graft and consistent output into a steady influx of sales revenue. ...transparency is key - showing what you do, how your do it and explaining why, is real brand equity building stuff. grow your delivery round, organically! ...would an egg vending machine really take off in Kerala? ...successful relationship marketing (account management) will keep up your profits and orders - stay in communication - help buyers add value downstream! The financial statement of your poultry farming business plan neatly pulls together all of your business figures into the most meaningful array. ...this statement lays out just how well the underlying holdings of your poultry business grants financial stability - or not. ...how many birds or eggs would you need to sell as a minimum in order to cover your costs alone? Once operational, keeping your poultry farm on track for achieving it's commercial goals will take keen management. Providing key indicators for success at your fingertips begins with diligence data gathering and record keeping. Putting such systems in place early will help you keep tabs and enforce sound governance throughout. Accurate source data is the backbone of any successful managerial decision making. Build into your business systems for getting your finger on the pulse of performance. It's a natural phase of business growth. How much should you grow your farm? What methods of growth would be most sustainable? Should you diversify e.g. local or speciality breeds? simply rinse and repeat for best results. Kerala State poultry industry awaits your entrance. Perhaps even the rest of India! 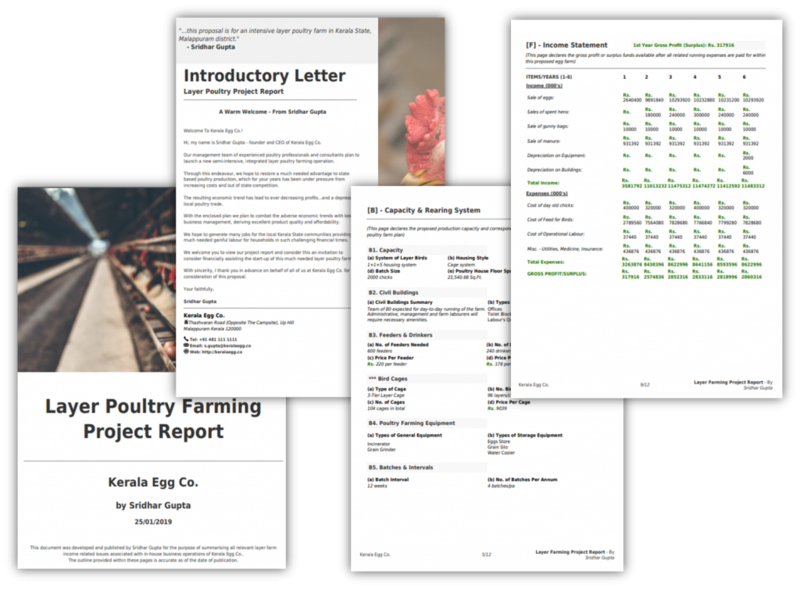 Need a helping hand drafting a winning poultry farming project plan? Any questions, feel free to ask us. Need FREE poultry farming advice? Get in touch. Have anything to add which we missed out? want your business to appear in this page? simply leave us a comment below and we'll get back to you. Thank you for reading - and we hope your new venture into poultry farming entrepreneurship in Kerala gets off to a flying start.